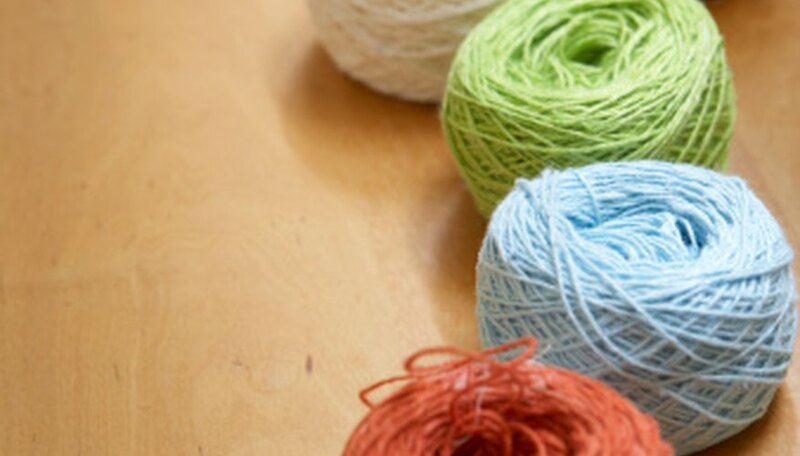 Crotchet thread, or crochet yarn, used to create lacework such as tea doilies, table-runners and decorative edgings, has traditionally been made in many sizes. The heaviest is size 3 and the thinnest is size 100, which is almost indiscernible from normal sewing thread. The three most common sizes are 10, 20 and 30, and patterns usually recommend which size to use. Size 10 crochet thread, also called bedspread weight, is the most widely used size. Of the three most commonly used variations of crochet thread, size 10 is the heaviest. You can see knots and stitches more easily on size 10 thread than on others. Because of its visibility, crocheters consider size 10 easier to work with than thread with a thinner size. In the United States, many patterns call for size 10. Size 20 crochet thread is slightly thinner than size 10. Even though size 20 is smaller, you can still observe knots and stitches with relative ease. Because the difference between the two sizes is minimal, you can use size 20 interchangeably with size 10 crochet thread without affecting the pattern drastically. However, you will have to adjust the gauge slightly to achieve the desired size. Using size 20 thread instead of size 10 will result in a finished product that looks finer and more delicate. Of these three crochet thread sizes, size 30 is the thinnest. Because of its fineness, size 30 is good for lacy patterns. It can be difficult to find size 30 crochet thread commercially, and you typically must special order it. Crocheters do not use it as often as size 10 or size 20. Substituting size 30 thread for a heavier size will require significant changes in the gauge for the pattern. Smaller size crochet threads produce an end product that looks more delicate than larger threads. When substituting smaller threads for larger ones, make sure to change the gauge appropriately. You will need more knots and stitches with a thinner thread. Most patterns come with a recommended gauge of how many knots or stitches are in an inch of finished work. To change the gauge for a smaller thread size, simply determine how many knots or stitches make an inch with the thinner size. Ashley Taylor is a university student working on a B.A. in English. She specializes in craft tutorials and beauty tips. Her first journalism job was with a sub-publication of "The Washington Post," where she copyedited articles for the Styles department.